In these lessons, we will be looking at how to solve different types of word problems using the Pythagorean Theorem. How to solve word problems using the Pythagorean Theorem? 1. Determine whether the word problem can be modeled by a right triangle. 2. Use the Pythagorean Theorem to find the missing side if you are given two sides. Shane marched 3 m east and 6 m north. How far is he from his starting point? First, sketch the scenario. The path taken by Shane forms a right-angled triangle. 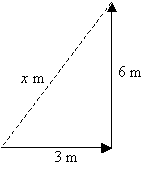 The distance from the starting point forms the hypotenuse. The rectangle PQRS represents the floor of a room. 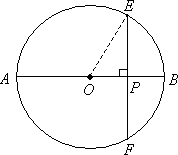 In the following diagram of a circle, O is the centre and the radius is 12 cm. AB and EF are straight lines. Find the length of EF if the length of OP is 6 cm. Problem 1: A 35-foot ladder is leaning against the side of a building and is positioned such that the base of the ladder is 21 feet from the base of the building. How far above the ground is the point where the ladder touches the building? Problem 2: The main mast of a fishing boat is supported by a sturdy rope that extends from the top of the mast to the deck. If the mast is 20 feet tall and the rope attached to the deck 15 feet away from the base of the mast, how long is the rope? Problem 3: If an equilateral triangle has a height of 8, find the length of each side. Problem 4: Two cyclist start from the same location. One cyclist travels due north and the other due east, at the same speed. Find the speed of each in miles per hour if after two hours they are 17sqrt(2) miles apart. Problem 5: Two cars start from the same intersection with one traveling southbound while the other travels eastbound going 10 mph faster. If after two hours they are 10sqrt(34) apart, how fast was each car traveling? Problem 6: A carpet measures 7 feet long and has a diagonal measurement of sqrt(74) feet. Find the width of the carpet. Problem 7: Jim and Eileen decided to take a short cut through the woods to go to their friend's house. When they went home they decided to take the long way around the woods to avoid getting muddy shoes. What total distance did they walk to and from their friend's house? Dimensions are in meters. Problem 8: Shari went to a level field to fly a kite. She let out all 650 feet of the string and tied it to a stake. Then, she walked out on the field until she was directly under the kite, which was 600 feet from the stake. How high was the kite from the ground?